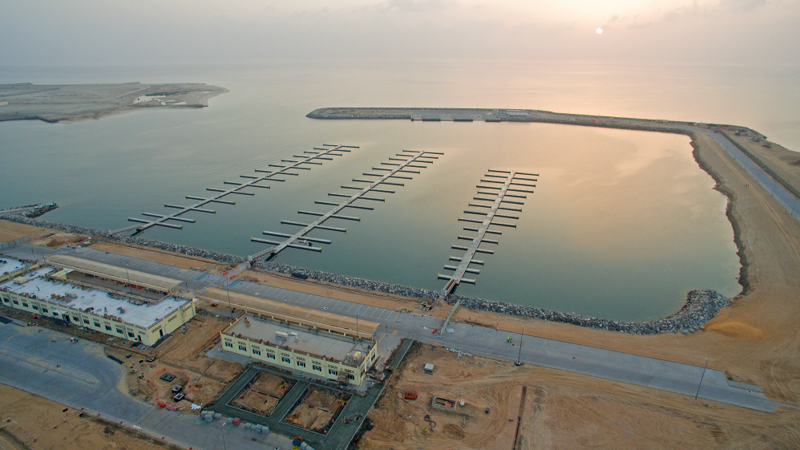 Marinas Performance, the JV of Superior Jetties and Al Masaood in the UAE have recently completed an extensive project for the Abu Dhabi Ports group. The project is located on the east coast of Delma Island, a small settlement with population of 5000, under the Western Region of Abu Dhabi Emirate. It is located approximately 280km west of Abu Dhabi, capital of the UAE, and 42km offshore (north) of Jebel Al Dhanna mainland and 27km west of Sir Bani Yas Island. 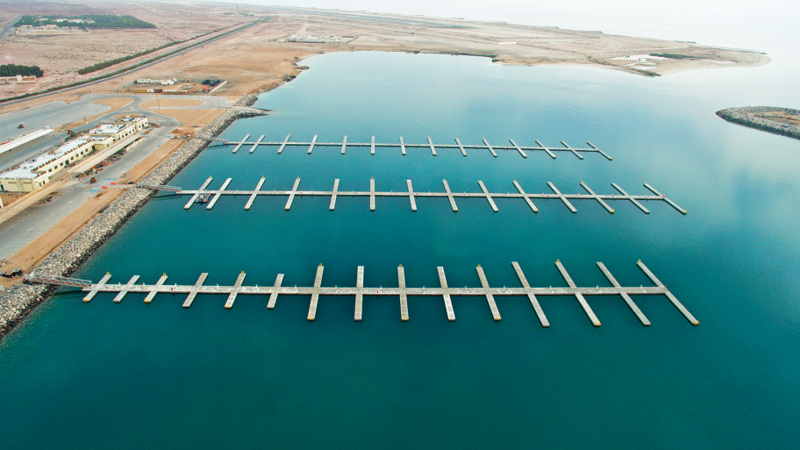 Part of Delma Commercial Port development, protected by the newly constructed rock breakwater basin , Delma Port will be a new key transportation hub on Delma Island. The new marina will enhance the existing facilities for local fishermen and make provisions for water sports and other public amenities. 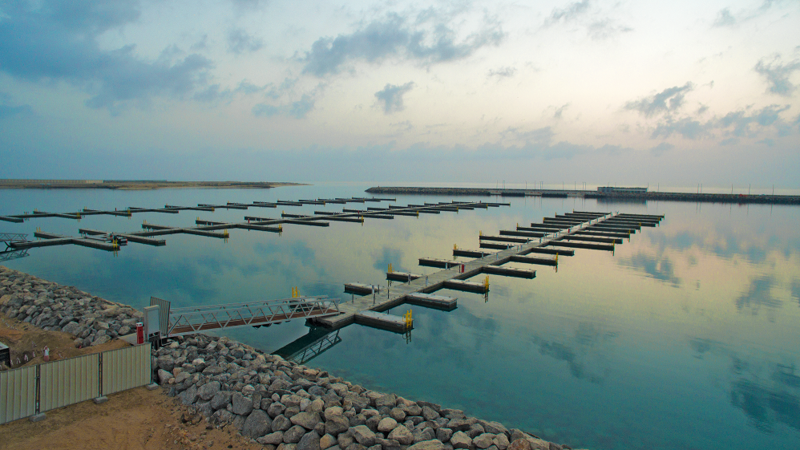 The client ADPorts commissioned a design and build project, that was designed in co-operation between Marinas Performance and Superior Jetties team of experts. It comprises a total number of 152 berths with the majority of the vessels being 15m long fisherman boats and wooden dhows. Leisure boats range from 5 to 15 meters. The marina features all concrete Superior Super Elite pontoons with 3m wide main walkways and 1,6m wide all concrete fingers for all boats. Large 15m long fingers are moored with SEAFLEX for additional stability and durability, using the patented Superior Trumpet Mooring System guides that are cast into the pontoons. Seaflex anchoring consisting of 280 SEAFLEX units and concrete deadweight blocks, connected through the Superior Seaflex Trumpets that allow for topside adjustments right from the deck. The installation was completed with bespoken sinker laying work boats by an expert team of installers.